(HR142-02) Full furnished house for rent in Vieng ping Villa, Doi Saket. 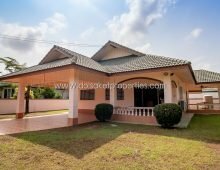 (HR150-02) Huge Unique Spanish style villa for rent near Promenada, Tha Sala. (HR221-03) New renovated 2 story house in Phruek Waree Land and House Village.